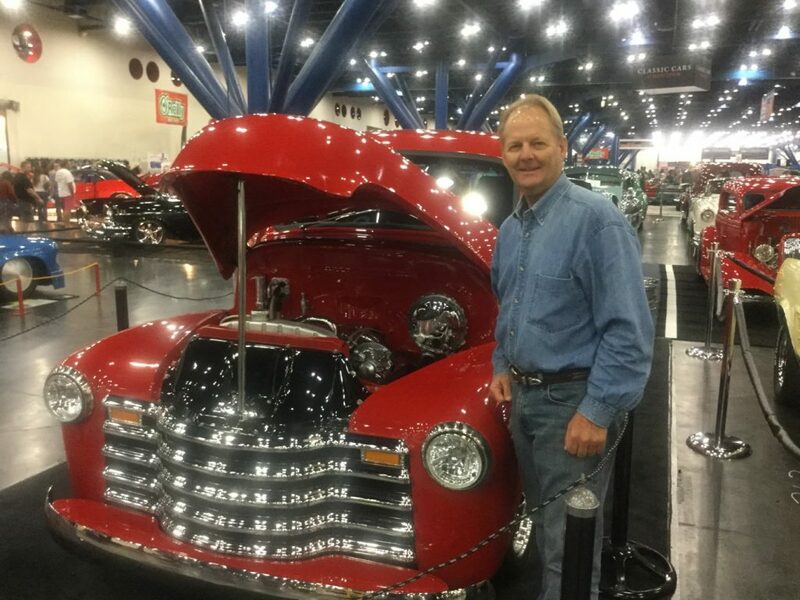 Roger Goettsch and his pride and joy, a ’49 Chevy pickup he restored. I received the following email from Roger Goettsch, CGCS, in the spring of 2018: I recently designed and built two different wetting forks for applying wetting agents to the soil in our LDS (localized dry-spot areas). We have had issues getting wetting agents into the soil due to the thatch layer and this seems to have helped… He attached pictures of the wetting forks in action, along with shots of the “Plug Pushers” he also designed and built, to remove cores following aeration. Goettsch is the head superintendent at Shanqin Bay Golf Club in the small town of Longgun, on the island of Hainan, in the People’s Republic of China. Like many American-trained supers working overseas, Goettsch can’t get his hands on every last piece of equipment his little heart desires. So he just builds what he can, himself, putting to work his AutoCAD skills, his welding and fabrication expertise, and a mechanical imagination born deep in the American heartland. Goettsch has worked all over North America, and now Asia, leaving behind him a trail of custom-designed and custom-built equipment — like breadcrumbs in the woods. Like those sprig planters you built for all those contractors? Or the fairway aerifier you whipped up that one night? When pressed for why exactly he’s compelled to build so many things — while simultaneously working full time, taking care of first-class courses from the Gulf to the South China Sea — Goettsch chalks it up to self-reliance, a quality his dad embodied and passed along to young Roger in the farmlands of western Iowa. Roger, his two brothers and three sisters were involved in all the works. The girls de-tasseled corn in the summer time. “We grew everything: all the garden vegetables; we had an orchard with peaches, cherries, plums and apples. Our freezer was always full of meat and my mother was always canning something. From the time I was a 5-year-old kid, I was also working on the farm. But my father’s workshop was the most interesting part of that operation. He built everything for us: wagons, cattle chutes, a bail elevator. He also built a riding lawn mower! I have two older sisters who swear that he was the first person to ever manufacturer a riding lawn mower. I have a picture of that I need to dig up. He built so many things. “In my spare time I used to hang out in his shop. I was more of a pest to be honest. Very curious, always wanting to tear something apart and see how it worked. Typically, I didn’t put things back together, which sorta pissed my dad off. Compared to modern shop, dad’s was so small. He made his own cut-off saw, to saw metal. He didn’t have an acetylene torch like I do today. “Not only did he build a lawn mower, he took old bicycle frames and built motor scooters for us. He took the bicycle wheels off, then modified the frames, welded a plate on there to mount an engine, and new tires. I could draw you a detailed picture of those things; I’ll never forget riding them around. You put your foot down, it tightened up a belt and you just went down the road! My dad bought my mother a Honda Dream 150cc motorcycle back in 1965. They knew it meant a lot to me, so they willed it to me when they died. My dad also had an Indian motorcycle that he totally refurbished — one of his pride and joys. The golf business just sorta happened to Roger Goettsch, the way it does for kids sometimes. In fact, if it weren’t for Dennis Wiebe, Goettsch might be somewhere in America, welding and/or fabricating something right now. As the story goes, “My friend Dennis dragged me to go golfing one day, even though I didn’t want to go. I might have been around 12 or 13. I fell completely in love with the game. That was all it took. During my junior high school days, folks started to build a 9-hole golf course in town. Cow pasture pool, that’s what my mother always called it. “I could not wait to be on the golf team when I became a high school freshman. Even though we didn’t have a course in Holstein before that. My friend Dennis — his family had built a house that backed up to this new golf course they were going to build. By then I’m playing regularly with him and I’m not too bad. From then on, I couldn’t play enough. My entire four years of high school, all I wanted was to be a pro golfer. “So the summer after my sophomore year, Tim decides to go off and get married. Because Steve and I were hanging out there all the time, and because his father was involved in building the club, they came to us and said, Would you boys like to take care of this place for 2 weeks while Tim is on his honeymoon? You can work as many hours as you want — and we’ll pay you. Well, we went crazy down there, working sun-up to sundown and they paid us a gold mine. “That winter, at school, Steve comes running down the hall: Dean Vollmer wanted to talk to us. He was chairman of the green committee. He and his brother Don owned the Chevy dealership in town. So we go down to the dealership after school and Dean says, Boys, I want you to know that the golf course was in so much better shape the 2 weeks you worked there. We want you guys to take care of the golf course this coming season. You want the job as a twosome? You can work all you want, we’ll pay you… and you can play the course all you want. The rest, as they say, is history. Goettsch went to Iowa State University and studied turf management, interning all four years at Des Moines Golf & Country Club under the legendary Bill Byers (though he also took as many metal-working classes as he could). After graduating (1978) and serving time as an assistant at several courses, he left the golf business altogether to pursue a welding career in the oil fields of west Texas. “I made a lot more money there than I ever made in the golf business,” he recalls. But golf work is steady; the oil business is not. In fact, when it collapsed in 1983, Goettsch went back to growing grass, his welding equipment in tow. He landed his first head superintendent’s job at Squaw Creek GC near Ft. Worth. Eventually, he would come to specialize in the construction and grow-in of new courses, something he did all over North Texas before landing his first high-profile head super’s gig at the Arnold Palmer Golf Club at Fossil Creek. He moved from there to a regional director’s position with the management company RSL (now Arcis Golf) before going overseas (Thailand and Indonesia) in the early ‘90s for two more construction/grow-ins. He returned home to do the same at The Bandit in New Braunfels, Texas, Blackhorse GC down the road in Cypress, and Redstone Golf Club (now the GC of Houston) in nearby Humble. He was Director of Agronomy at Barton Creek’s 72 holes when he was lured back to Asia in 2014 — first to India, then to China. But that thumbnail sketch, diverse though it is, leaves out nearly all of his creative, metalworking history. “Bill Byers had so much faith in my ability, he bought an entire pump station and I did all the fabrication and helped [pump engineer] John Tucker install it at Des Moines Golf & Country Club,” Goettsch recalls. “At some point, after I’d become a super, I went out and bought all my own welding and fabrication equipment — and I brought it all with me from job to job. I do think that was a consistent benefit to my employers. These skills have honestly never got in the way of my relationship with the mechanic. Quite the opposite. I always had a great relationship with the mechanic, because he could see that I could help him and my passion for his work was real. “At Squaw Creek we hired a mechanic who was a real machine shop guy —he could work a metal-turning lathe. Between him and me, we made things like a mechanical edger for the greens. Built the whole damned thing, because he could do all the shafting. We built some unbelievable stuff at that time… I don’t believe there’s single mechanic I’ve had the pleasure of working with in the golf business who doesn’t absolutely love me. We would collaborate. I built things they would never think of themselves: roll-around benches, shelving, custom things for their shops. You can buy that stuff, sure. But if you got a shop with small rooms, we made it all fit. I built a boat trailer out of aluminum one time — for a pontoon boat. I repaired things out of steel, stainless steel, cast iron. Back in the day cast iron was difficult to weld. You really had to know how to do it. I had one Toro representative who used to yell at me: Goettsch, put that welder away so we can sell you more iron! These skills tend to get the attention of various engineering types, too, whom Goettsch greatly admires. Squaw Creek was where he met P.C. Schedule, who ran a pump station business. Goettsch would end up doing all manner of jobs with/for Schedule and John Tucker, on the side, though he gathered as much as he contributed. This sort of efficiency should have given a Goettsch a bit more time for himself, for his family. But only recently has he achieved that sort of balance in his life. The past few years, Goettsch takes digital images of all his projects. Pre-digital, it was all old-fashioned photography. Those snap shots — documenting his many, many creations through the years — can today be found in a storage unit outside Dripping Springs, Texas, near Austin. That’s also where you’ll find Goettsch’s enduring pride and joy, a 1949 Chevy pick-up that he helped refurbish (a classic restoration that took 16 years). In Goettsch’s absence, his car buddies still display it at various shows around the American Southwest. These acts of creation are a form of friendship and intimacy — the same things his dad provided to him, for the same reasons. “I think there’s some truth to that,” he says. “While I’m building things for the golf course, I’m usually building other stuff for other people. It gives me a real good feeling, building relationships in the process.